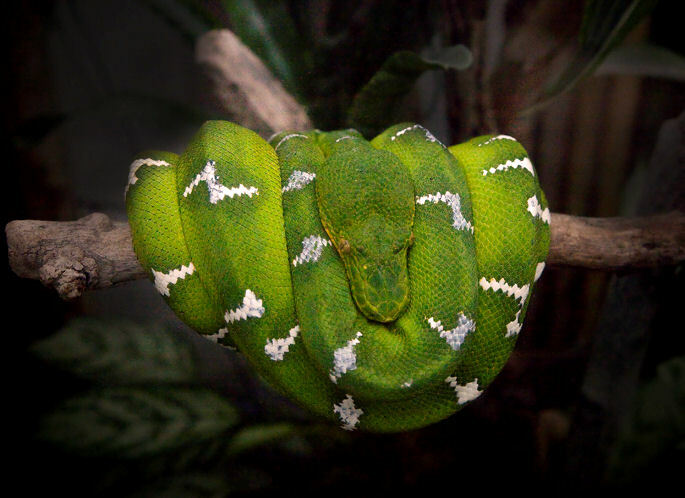 Emerald tree boas, as their name suggests, are a tree dwelling species, spending most of their time high up in the foliage. They prefer to be solitary. They are found in lowland tropical rainforests in the Amazonian and Guianan regions of South America. Emerald tree boas are nocturnal ambush hunters. They lie in wait on a branch above the ground, waiting to strike at any unsuspecting small rodents that walk beneath them. Emerald tree boas are known as ‘live bearing’ snakes. This means that they do not lay eggs like many other snake species, but retain the babies internally and then ‘give birth’. Unlike mammals, there is no placental connection to the mother – each juvenile is contained inside its own gelatinous sack. Over collection for the pet trade and loss of habitat are the two main threats for this species, however it is not considered to be at risk of becoming endangered.